Slip and falls may not seem like major accidents, but they happen more often than people think. When they do, people can become seriously injured. Slip and fall accidents can lead to brain injuries, broken bones, paralysis, and more. When people slip and fall on someone’s property and become seriously injured, they may be able to file a lawsuit to claim compensation for their injuries. However, this is not always true. A slip and fall case will rely mainly on determining negligence, both that of the property owner’s and the injured individual’s. Both of these factors will be a major factor in the success of a slip and fall case. Under Pennsylvania’s premises liability law, property owners are responsible for ensuring their property is safe for people to enter. Every person entering the property is owed a certain duty of care. For example, if a customer in a grocery store spilled a liquid and someone slipped and fell on that liquid, the grocery store owner may or may not be responsible. If the owner or employees were not made aware of the spill, they may not be found negligent because they had no knowledge of the spill. If the customer that caused the spill told the employees or the property owner however, and it was still not cleaned up, that could be considered negligence. On the other hand, if the customer that caused the spill did not alert the store’s employees or the property owner, but the spill was left for hours, this could still be considered negligence. This is because property owners are responsible for knowing about the conditions on their property, particularly after a reasonable amount of time. It is also reasonable to assume that an employee or the store owner would come across the spill after several hours and, should have cleaned it up at that time. Property owners are responsible for ensuring safe conditions on their property. Individuals also have a responsibility though, to watch where they are going and generally to keep themselves safe. 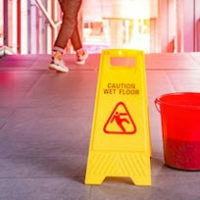 As such, under Pennsylvania’s comparative negligence laws, when individuals have little regard for their own safety, they can be considered partly responsible for a slip and fall accident. Pennsylvania law states that when a person is more than 50 percent responsible for their own accident, they are barred from filing a lawsuit and seeking compensation. An example of comparative negligence would be if there was a patch of ice on someone’s doorstep. The owner is responsible for salting the ice, or warning visitors of its presence if it cannot be corrected. However, if an individual visits the property in the middle of winter and isn’t wearing proper shoes or boots with good traction, they may be found partly responsible for the accident. This is because proper footwear could have prevented the accident. Assigning fault in a slip and fall case and determining if an injured individual has a valid case is not always easy. Anyone that has slipped, tripped, and fallen on someone else’s property and been seriously injured needs to speak to an experienced Pennsylvania premises liability lawyer that can help. If you have been injured in a slip and fall accident, contact Haggerty, Hinton & Cosgrove, LLP at 570-344-9845. We will review your case, establish fault, and inform you of your chances of success in court. If you have a valid lawsuit, we will help you pursue it and fight to ensure your rights are upheld in court. You don’t have to deal with your injuries on your own. Call us today and we will help you claim the full amount of compensation you may be entitled to.